Licenses: Australian Financial Services licence number 364264 issued by the Australian Securities & Investments Commission. The first impression you get when visiting the home page is of a platform that is focused and doesn’t stray too far out of its circle of competence. The site offers two basic option types, HIGH/LOW and HIGH/LOW Spread (there are 2 additional options based on the same concept but with different timeframes). The time frames extend from 1 minute to 1 hour but changes depending on the option you choose to purchase. Currency pairs are the main available assets. HighLow is a sleek binary platform focused on an Australian audience. The platform is regulated by the Australian Securities & Investment Committee (ASIC) and holds an Australian Financial Services License. AFSL is difficult to get as the licensed body needs to meet high standards in the areas of capital requirements, risk management, staff training, accounting and audits. However, despite being licensed through the ASIC and with a focus on Australian traders, HighLow accepts clients from around the globe. When you an open account, the platform will ask you to input your country. If your country is on the drop down list, you are good to go. The HighLow broker trading platform is highly intuitive. It’s easy to use for beginners, and has a wealth of information for more advanced traders. Everything you need to make winning trades you have on screen. On the top, there are tabs for each of the four options the broker provides – Spread High/Low, High/Low, On Demand, Spread On Demand. When you click on each tab, you will see some slight changes as the timeframes change depending on the option you are looking to purchase. Below the tabs, you can choose a time frame. Below the time frames is a ticker which shows you the price of the underlying assets you can choose. Then there is the dynamic graph which changes with the market data. On the graph you can actually purchase the option by clicking either the high or low button, depending on how you anticipate the market will move. 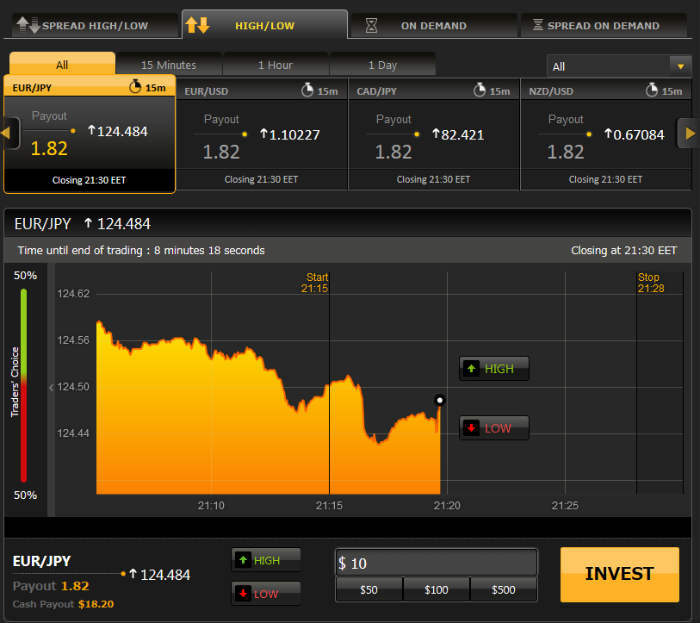 See screenshot for how the trading platform looks. HighLow offers a wide range of currency pairs which is great for those who specialize in binary options in the Forex market. They offer main major currency pairs, major currency pairs, and even some cross currency pairs. Below is the full list of currencies offered. For traders who are looking for a diverse binary portfolio, HighLow only offers a minimal assets outside of currencies. HighLow’s non-currency asset selection is quite narrow offering only 5 indexes – AUAUS200, HKG33, JPN225, UK100, US30. HighLow offers 4 different types of options. HighLow Option: If you are looking to purchase a HighLow option, the trading platform will show you the mid price of the underlying asset as well as when the option expires. The payout is between 180% to 190%. Option on Demand: This is similar to the HighLow option, but you get to choose when you want the option to begin. The payout is also between 180% to 190%. Spread HighLow: This option allows you to trade against a spread of the underlying asset. Spread HighLow offers a return of 200%. Spread on Demand: This is similar to the Spread HighLow, but you can choose when the option will begin. The return is also around 200%. HighLow offers the convenience of trading from both iOS and Android phones. HighLow offers a few different bonus schemes. New Accounts: The platform offers up to 50 (AU$/US$/€/£) cashback on initial trades. Loyalty Programs: The platform offers account holders a loyalty program where you accumulate points depending on your account tier level. HighLow offers a fast and easy way to practice trading and get a sense of what it’s like to trade on the platform. To open a quick demo on the platform there is a conveniently placed button right below the open an account option. You don’t even need to register with the platform to try the Quick Demo! Because HighLow accepts clients from around the world, the platform also accepts international currencies. If you are depositing with Australian dollars, the minimum deposit for a bank transfer is AU$10 for Credit Card or Neteller the minimum deposit is AU$50. For all other currencies (US$/€/£), the minimum deposit for all transfer methods is 50 US$/€/£. When withdrawing funds, the platform asks that for those withdrawing funds via bank to wait between 1-3 working days. If you are withdrawing money to a bank transfer the minimum is AU$10 or 50 US$/€/£ for other international currencies. Withdrawals processed through Credit Card or Neteller are processed immediately. However, the minimum amount for withdrawal via Credit Card or Neteller is 50 for all currencies (AU$/US$/€/£). I am so stocked that I found Highlow, This review proved why is the best broker for Aussies.